Tami is co-writer, -performer, -producer (-everything!) on the animated comedy webseries, Roommates, Not Lovers. www.roommatesnotlovers.com. 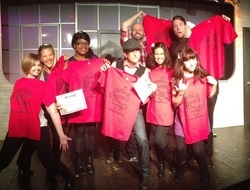 As a graduate of iO Chicago, and a graduate of the Second City Conservatory (RED SHIRT! ), Tami is often found performing for classes and as a guest performer with groups such as Smokehouse, GamGam, Daddy Doesn't Live Here Anymore, and more! She is currently appearing in Second City Hollywood's long-running Really Awesome Improv Show, and the Harry Potter-inspired improv show The Show That Shall Not Be Named.